The length of a correct Komboloi is very important. It is to be so just enough to wrap around the palm. Between the two rows of beaded and “Pappas” (called as the largest bead to the edge of the chaplet) there must be a gap, a distance of about four and half fingers. Older prefer greater distance because it helps beads bump into each other with more speed and stronger beat. The beads should always be an odd number because of three reasons: The first has to do with the visual, design and balance. The single bead at the bottom creates a perfect semicircle. The second is a special game with beads, very favorite and usual. Allow the two to two beads to fall downward, creating a rhythmic sound, melodic. When all the pairs are finished, the single bead plays an important role. 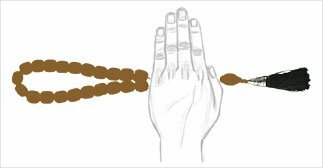 It prevents the rosary from leaving our hands and falling on the ground. Third and lastly it is because the odd number always bring luck and happiness to its owner.